Sessford et al. have performed a high-resolution, multi-proxy analysis of the sediment core GS15-198-36CC and recently published their results. The core was retrieved from the northern bank of the Greenland-Iceland Ridge, and exhibits a 30-year temporal resolution during the Dansgaard-Oeschger events 8-5 (40-30 ka). Multiple proxy records were measured for this time period: magnetic susceptibility, oxygen and carbon isotopes for N. pachyderma and C. neoteretis, absolute abundance of benthic species C. neoteretis and E. excavatum, and trace element ratios of benthic species C. neoteretis. The age model for GS15-198-46CC relies on the published age model established for core PS2644-5 by using magnetic susceptibility tie points. 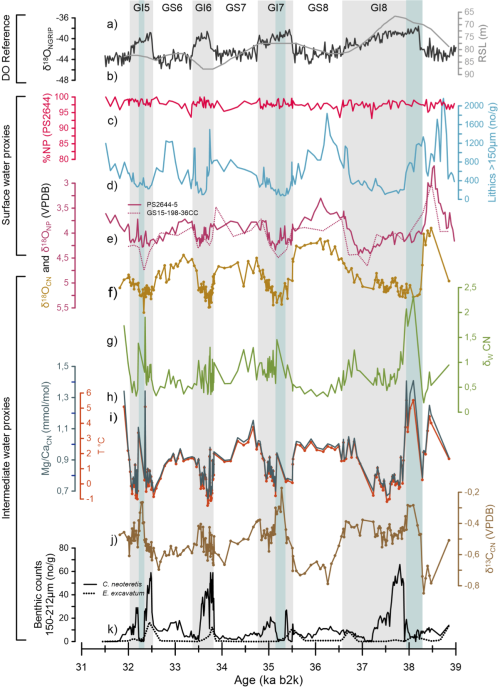 The chronology is refined by stratigraphically tuning the marine magnetic record to the NGRIP δ18O record. The Mg/Ca record, which is the first for benthic species during this time period in this region, indicate warm intermediate water in the Denmark Strait during stadials and cooler water during interstadials. However, while the stadials are quite stable periods, the interstadials exhibit an instability of the water column, rapidly warming and cooling within the first half of the interstadial, and gradually warming throughout the second half. These data are supported by the stable isotopes and absolute abundance counts of the same species, C. neoteretis. The datasets can be downloaded here. Down core data set from (a) NGRIP, (c–e), PS2644‐5 and (e–k) GS15‐198‐36CC covering the period between 39 to 31.5 ka and D‐O events 8–5 on the GICC05 (b2k) age scale.